Narrator: The Garden of Eden was a wonderful place. It was a place where Adam and Eve, the only two people in the world, were able to walk and talk with God. They had God, and they had each other, and the garden gave them everything they needed. What could possibly go wrong? Narrator: What happens next is the saddest part of the story of God’s kingdom. In Genesis 3, we see things go very, very wrong because of the choices Adam and Eve make. The snake in Genesis 3, who is described as clever and evil, is identified in the book of Revelation as Satan, or the devil. In Revelation chapter 12 verse 9, it says “…That snake, who fools everyone on earth, is known as the devil and Satan.” And as we’ll see, he certainly led Adam and Eve to make a very bad choice. Satan: Did God tell you not to eat fruit from any tree in the garden? Woman: God said we could eat fruit from any tree in the garden, except the one in the middle. He told us not to eat fruit from that tree or even to touch it. If we do, we will die. Satan: No, you won’t! God understands what will happen on the day you eat fruit from that tree. You will see what you have done, and you will know the difference between right and wrong, just as God does. Woman: Well … the tree is so beautiful, and its fruit does look delicious. And I want the wisdom it will give me. I’ve decided—I will eat some. Here, Adam—you should have some! Adam: It does look delicious. I’ll eat some too. Adam: (embarrassed) Wait—we’re naked! We don’t have any clothes on! Woman: Oh, no … don’t look at me! Adam: Here, take these fig leaves. We can sew them together to cover ourselves. Narrator: That evening, when the cool breezes were blowing, they heard the LORD God walking about in the garden. Adam: God can’t see us like this. Woman: We need to hide. Adam: Quickly! Behind these trees. God: Adam? Where are you? Adam: I was naked, and when I heard you walking through the garden, I was frightened and hid! God: How did you know you were naked? Did you eat any fruit from that tree in the middle of the garden? Adam: (Blaming the woman, and God for giving her to him) It was the woman you put here with me! She gave me some of the fruit, and I ate it. God: My daughter … what have you done? Woman: The snake tricked me. And I ate some of that fruit. God: Because of what you have done, you will be the only animal to suffer this curse—for as long as you live, you will crawl on your stomach and eat dirt. Narrator: Then God made a very important promise, a promise that He would keep until his Rescue Plan was completed thousands of years later when He sent His Son, Jesus Christ. God: You and this woman will hate each other; your descendants and hers will always be enemies. One of hers will strike you on the head, and you will strike him on the heel. God: You will suffer terribly when you give birth. But you will still desire your husband, and he will rule over you. God: Adam, you listened to your wife and ate fruit from that tree. And so, the ground will be under a curse because of what you did. As long as you live, you will have to struggle to grow enough food. Your food will be plants, but the ground will produce thorns and thistles. You will have to sweat to earn a living; you were made out of soil, and you will once again turn into soil. Adam: Because you will be the mother of all living, your name is Eve. God: These people now know the difference between right and wrong, just as we do. But they must not be allowed to eat fruit from the tree that lets them live forever! 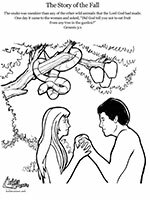 Adam and Eve – you must leave this place. You are banished from the Garden. Narrator: Thankfully, the story doesn’t end there. God didn’t give up on his creation or his kingdom. One day, the world in which we live will become perfect again. If you think back, you’ll remember that when God made his judgment, He cursed the serpent and made a promise to Adam and Eve. This is the first biblical promise of the Gospel: that Jesus, God’s Son, would defeat Satan. God also showed in another way that he still cared about Adam and Eve. He gave them clothes. They were still his image bearers, and they would work in the world he had created. The garden might be closed to Adam and Eve, but they had a promise from God that Christ would come. If you’d like to read more about God’s people and God’s promises, why not read the Old Testament book of Genesis? It’s the first book in your Bible.